In the first few months, babies only need milk and parents do not need to worry about the next challenge in parenting: solid food. 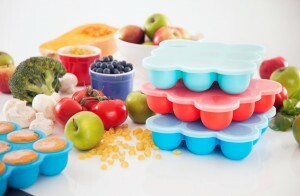 Introducing solid food is not a hard task, yet it requires a lot of knowledge in order to make informed decisions. The following tips are the results of personal experience of my wife and myself, combined with a lot of reading sessions. Most babies can be introduced to solid food some time between 4 months to 6 months. Some picture booklets that I saw seemed to be a bit misleading, showing that solid food starts at 4 months. In reality, every baby would have different starting moment and parents need to decide on the timing based on their babies’ clues. The earliest age a baby can start solid food is 4 months. It means that before this age, it is not recommended to give them solid food, except when advised by doctors. Usually, when a baby is ready, he will start showing interest when looking at adults having meal or snacks. Starting from 4 months, my wife and I put our baby in a position where he can see us having dinner. After a month of no response, he finally started to look interested at the age of 5 months, and that’s when we decided to start solid food for him. 2. What if a baby does not show interest even after 6 months? When a baby is born, he is equipped with enough iron for the first 6 months. After 6 months, he needs to get some new intake from solid food. Therefore 6 months is theoretically the latest starting point of solid food. If no interest is shown until near the time limit, parents might consider to see a doctor or child health professional and get some advice. 3. What should be given? If a baby starts eating solid food before 6 months, he could only eat fruits or vegetables in puree form. Make sure there is no lump or chunks, especially in the first few weeks of learning to eat solid. As a baby gets more experience, he can start having food with more texture. Starting from 6 months, more types of food can be introduced, like fish and meat. Introducing food with high-risk of allergy such as eggs, cheese or nuts might require special discussion between parents and doctor. Especially in families with history of allergies. From 8 months, parents can start offering finger food to babies. Be aware that NOT all fruits or vegetables are safe for babies. To find out common fruit and vegetables to be given as baby food, you can go to a supermarket and have a look on the available packaged baby food from various brands. I am not telling you to feed those factory-produced food for your baby, but instead have a look at their ingredients and we can get some ideas of what kinds of fruits and vegetables are inside. Most baby food will have 4+ or 6+ or 8+ labels. You will quickly notice that some ingredients can never be found in food for younger age limit and some others can be found in all groups. That is a good clue to make sure we do not give ingredients certain ingredients before our baby is ready. 4. How many times in a day? For babies under 6 months, solid food can be given 2 or 3 times a day. At 4-6 months, solid food takes lower priority compared to milk (breast-milk or formula). It means, feeding session should be started with milk first, then offer solid food, then offer a little bit of milk again as after-meal drink. It is not recommended to give water to babies under 6 months unless instructed by doctor. For babies 6 months and above, solid food should be offered 3 times a day. A meal session starts with solid food, then optionally small amount of cooled boiled water can be offered, followed by milk. 5. How about combining ingredients? Technically, babies under 6 months do not really need solid food yet. So solid food is more aimed towards introducing various tastes. At this stage, I personally would choose not to mix different ingredients (such as baby rice cereal and banana). I prefer to introduce one fruit or one vegetable at one time. The common pattern is to introduce the same food for 3-5 days in a row, then move on to the next fruit/vegetable. This will give a baby enough time to actually figure out the taste. Quite often, my baby did not like a particular ingredient on the first day, then came to like it better in the following days. Babies 6 months and above can be introduced to more variety of food, including food with combined ingredients. 6. What is the right serving size? There is no right or wrong here. Basically parents need to read clues from their babies. However, as a general guidance, in the first few days of solid food, babies usually don’t eat much. Some would finish one teaspoon of puree. Some others might be able to finish two. And having some of the puree ended up on their bibs and highchairs is perfectly normal. After all, early phase of solid food introduction is more about taste exploration instead of “eating” itself. As our babies get more accustomed to solid food, gradually increase the serving size.